The main source of law governing conduct in the securities market is the Securities Act of 1968. Additionally, the Companies Act, 1999 also applies to conduct relating to securities and a violation of the Securities Act may also violate the Companies Act. Of specific note in this context are Articles 191–193 of the Companies Act, which deal with cases in which a corporation is managed in a manner that is oppressive to all or some of its shareholders. The remedies available in such cases are of great breadth and depth. Essentially, a court may hand down any order it finds helpful to remedy the harm.2 The court may even compel a controlling shareholder to purchase minority shares. Additional pieces of legislation available to plaintiffs will be further discussed below. The Israel Securities Authority (ISA) is the agency responsible for oversight and regulation in the field of securities, including the field of investments, trust funds and public companies. The ISA is the agency responsible for conducting and initiating criminal and administrative proceedings against violators of securities laws. In both types of actions it is the ISA that decides to launch an investigation and the one responsible for conducting the investigation. In administrative proceedings, it is also responsible for initiating the proceeding itself and conducting it against the violator, before an administrative enforcement committee that includes ISA representatives. In criminal proceedings, upon conclusion of the investigation, the ISA conveys to the taxation and economy department of the competent district attorney’s office (DA-TaxEc) its recommendation to initiate a criminal proceeding against the suspect, and the district attorney’s office decides whether to press charges and conduct the proceeding in court. Court cases are generally tried before a special division of the District Court of Tel Aviv, known as the Economic Division, which is comprised of designated judges with specific expertise in economic matters. Criminal cases are brought before magistrates’ courts and district courts, in accordance with the general rules of jurisdiction. In recent years class actions in general, and class actions alleging securities misconduct, have become more and more common. Administrative proceedings initiated by the ISA are also noteworthy. Additional forms of lawsuits are further discussed below. Article 32 of the Act is noteworthy in this context. It is a specific provision, aimed at ‘second circle’ tortfeasors, such as advisers, accountants and legal counsel. The provision stipulates that any person who has given an opinion, report, overview, or approval, is liable for any damage arising from a misleading detail contained therein, if the report, overview, opinion or approval were included in a prospectus by way of reference. Therefore, in theory, a private investor who has suffered damage as a consequence of a violation of the Securities Act may file a ‘regular’ private lawsuit against the relevant tortfeasor. However, in practice, lawsuits are commonly filed in one of three forms: as a class action, as a derivative action and as an appraisal claim following a going-private tender offer that entailed compulsory acquisition. As in other jurisdictions, a class action is a procedural way to aggregate claims of dispersed (potential) claimants. A member of the class attempts to represent all class members, and is – if successful – rewarded for the effort in filing the lawsuit. Naturally, representing parties who have not explicitly empowered the representative is an unusual phenomenon. Strict standards are thus set for certification of class actions. A class member who wishes to be appointed as a representative must file a motion to certify the action as a class action. Respondents are then required to file a response, after which the petitioner may file a response to the response.8 In 2015 the Israeli Supreme Court ruled that serving a third-party notice in a class action suit requires the court’s permission,9 which – according to the ruling – is to be granted if the third-party notice is adequately established. The court also ruled that the motion to grant permission to serve a third-party notice must be submitted simultaneously with the defendant’s response to the motion to certify the class action. As a general observation, courts tend to be more concerned with the substance of the claim than with procedural issues. Courts will tend to certify class actions where wrongdoing has been demonstrated prima facie. A host of solutions are at the courts’ disposal for resolving procedural issues (e.g., replacing the class representative). As in other jurisdictions, a derivative action allows a plaintiff (a shareholder, a debtor or a board member12) – subject to the approval of the court – to file a lawsuit on behalf of the company. If the court finds the settlement to be, prima facie, one that may be sanctioned, it will normally order its details to be made public so that interested parties may weigh in. The court will also generally notify the Attorney General and the ISA, to allow them to comment on the proposed settlement as well. In today’s global world, an important issue is the question of what effect, if any, a judgment regarding a settlement in a class action suit outside Israel should have on a class action suit filed in Israel concerning the same factual and legal questions. In a landmark decision,26 the Israeli Supreme Court recognised the possibility that a court-approved settlement in a foreign jurisdiction may have a binding effect on the plaintiff in a class action suit in Israel, if certain conditions are met (such as the foreign court having substantial connections to the issues discussed in the Israeli class action suit). If the Israeli class action suit has not yet been certified by court, the binding effect will concern only the plaintiff himself, and not the entire class. The court then instructs on the manner in which the details of the settlement are to be made public. A shareholder or board member of the company may file an objection, within the time frame set by the court. When the lawsuit pertains to matters dealt with in Section 204 of the Act (mainly prohibited distribution), a creditor of the company may also file an objection (within the same time frame). Damages and remedies are generally those available in any civil case. Generally, a party may seek monetary compensation for damages suffered as a result of a violation of the Securities Act. Alternatively, cease-and-desist orders may be issued, as well as operative orders ordering the defendant to act in a specific manner. A party may also seek to collect profits accrued to the violator under the Unjust Enrichment Act, 1979. One last issue of importance relates to the quantifying of monetary compensation in a forced acquisition. According to the Companies Act, an entity that wishes to increase its holdings in a publicly traded company to more than 90 per cent of the shares (or more than 90 per cent of a specific kind of shares), must make a uniform going-private tender offer to all shareholders. In essence, the purchaser must offer to purchase all shares (under the same terms). If a certain percentage of the shareholders accept the offer, all shareholders must sell their shares at the agreed price, and the company ultimately becomes a private company.29 An offer must be made to all shareholders, even if the purchasing entity holds more than 90 per cent of the shares before the offer. Article 338 of the Companies Act stipulates that anyone who received an offer within the framework of a going-private tender offer may plead the court to rule that the consideration received for his or her shares was lower than their fair value. A petition of this sort may also be filed as a class action. In the landmark Atzmon case,30 the Supreme Court has addressed the issue of the appropriate way to assess the fair value of shares and ruled that the fair value is generally to be assessed according to three governing principles. First, the ‘internal value’ principle, according to which the value of the company is to be ascertained based on sources of income stemming directly from the company, which the shareholders would have enjoyed had the company remained public, and not on ‘external’ value such as the value of the company’s securities. The second principle is the principle of valuation according to the company’s value as an ongoing business. This principle stands in opposition to the possibility of aggregating the value of the company’s assets. Under regular circumstances, the company as an ongoing business can be expected to yield greater value than the sum of its assets’ values. Third, the value of the company is to be assessed at the time of the going-private tender offer. It is not to include the benefits accruing to the purchaser as a result of the forced acquisition itself. Both criminal proceedings and administrative actions are available to public authorities. The criminal proceeding is adjudicated, in most cases, by the Economic Division of the Tel Aviv District Court, which has the authority to adjudicate all criminal charges in the field of securities within the jurisdiction of the Tel Aviv District Court (unless a decision was made to press charges in the magistrates’ court). The Division was founded in 2012 and is composed of a team of judges that possess expertise in the economic field, with the aim of providing a swift, efficient and professional service in cases of this kind. The ISA decides whether to direct the treatment of a violation to the criminal route or to the administrative route, based on considerations listed by the legislator: the severity of the act or omission and the circumstances thereof, an estimation of the nature and quality of the evidence, and the ISA’s enforcement policy. The choice between a criminal and administrative proceeding is made according to detailed standards predetermined and published in advance by the ISA. The administrative proceeding is intended mainly to address less severe violations of the law, specifically violations in which the mens rea is of negligence rather than deliberate misconduct. In addition to the two previously discussed options of conducting a public proceeding against violators, the ISA also has the authority to impose a pecuniary penalty on violators without conducting a proceeding, with respect to a list of violations of a lesser severity, which usually do not require the establishment of mens rea. In recent years we have observed a growing number of cases being pursued by the ISA through administrative proceedings with penalties in administrative proceedings becoming more severe. We have also observed the imposition of personal liability and sanctions on office holders as well as on the corporation. There has also been an increasing severity in the penalties issued in criminal proceedings. In particular, unlike past practices, the courts have recently started imposing actual (not suspended) incarceration sentences for insider-trading cases (whereas in the past, incarceration sentences were only imposed in fraud cases). Criminal proceedings begin with an investigation conducted by the ISA. The ISA may seize property, search offices and private residences and also arrest the suspected individual or individuals under certain circumstances. After the case file is examined by the DA-TaxEc, and before a decision to file an indictment, the suspect is entitled to a hearing before DA-TaxEc and has the right to review all investigation materials. The criminal proceeding is conducted in court, in a full adversarial process. The court’s ruling is subject to appeal to the higher instance (usually the Supreme Court). Administrative proceedings begin with an administrative inquiry, wherein the ISA has investigative powers very similar to those it has in criminal proceedings. The main difference is that in an administrative inquiry, the ISA is not authorised to search the suspect’s private residence. During the inquiry the suspect is neither entitled to legal counsel nor to avoid self-incrimination. By law, the suspect is only entitled to peruse investigation materials that the ISA deems relevant to the case, though in practice the ISA allows suspects to peruse all investigation materials gathered in the case file. The administrative proceeding is held before an administrative committee, which is not bound by evidentiary law and which may give instructions for the purpose of efficient deliberation of the proceeding. Witnesses are usually not heard in the administrative proceeding, unless the administrative committee has decided, under special circumstances, to summon them. Upon conclusion of the administrative proceeding the administrative committee determines the penalty to be imposed on the violator. In certain cases the committee’s determination is subject to court approval. The DA-TaxEc and a defendant in a criminal proceeding may engage in a plea bargain, as in other criminal cases. A plea bargain is subject to court approval. In most cases, the court upholds plea bargains presented to it (even in cases where, in the court’s opinion, it would have been appropriate to determine a different sentence). In addition, the DA-TaxEc may also enter a settlement for a conditional cessation of proceedings with a suspect, before filing an indictment against him or her, wherein the DA-TaxEc undertakes to abstain from filing an indictment against the suspect in return for his or her consent to be subjected to an enforcement measure of those available in the administrative proceeding. In administrative proceedings, the Director General of the ISA has the power to reach a settlement for abstention or cessation of proceedings with the violator, wherein the Director General undertakes to abstain from conducting proceedings or to cease the proceeding, in return for the suspect’s consent to be subjected to enforcement measures available in the administrative proceeding. Such enforcement settlements require the approval of the ISA Administrative Enforcement Committee. The Committee has determined that to approve such a settlement, the violator must also recognise the acts attributed to him or her, and sometimes even to concede that he or she has committed the violations. The majority of administrative enforcement proceedings are concluded by enforcement settlements. In criminal proceedings the court may sentence the defendant to incarceration and fines, according to the type of offence. When sentencing defendants, the court usually weighs a number of considerations. Among these are public considerations pertaining to the harm to the stability and fairness of the capital market and the public’s faith in it, the damage expected to be caused by the offence, the premeditation of the offence, circumstances of the offence’s severity and the defendant’s relative role in committing the offence. The court will also consider individual factors (efforts to rectify the outcomes of the offence, level of cooperation with law enforcement agencies, etc.). In the past year, the range of sentencing (including in proceedings concluded through approval of a plea bargain) was between several months and several years (up to six years) of actual incarceration. On occasion, alongside incarceration, a fine was also imposed, at amounts ranging from tens to hundreds of thousands of shekels, and 1 million shekels in one case. In administrative proceedings, enforcement measures included fines of up to 1 million shekels for an individual and 5 million shekels for a corporation per violation; compensation to those injured by the violation; an undertaking to take actions to rectify the violation and prevent its recurrence; and a prohibition on individuals serving as senior office holders in entities regulated by the ISA for up to one year (and, with the court’s approval, up to five years). The considerations guiding the Administrative Committee in determining a penalty are provided by law and include the facts constituting the violation; other factual circumstances of the violation, including the scope of the violation, the gains obtained or the loss averted by it and the damage caused by it; the existence or absence of previous violations; the actions taken by the violator upon discovery of the violation, including cessation of the violation of his or her own volition and reporting it to the ISA, actions taken to prevent recurrence of the violation and minimisation of the damage caused by it; personal circumstances of the violator that led to committing the violation or other exceptional personal circumstances; and the ISA’s enforcement policy. Penalties in administrative proceedings have thus far included personal fines ranging from tens of thousands of shekels to 400,000 shekels for individuals, and fines ranging from hundreds of thousands of shekels to 7.5 million shekels for corporations. Beyond this, an undertaking to take measures to prevent recurrence of the violation may be imposed on corporations and restrictions on service as office holders imposed on individuals, for periods ranging from four months to two years. According to the position of the ISA and the rulings of Israeli courts, Israeli law applies to all corporations offering their securities to the Israeli public, regardless of their place of incorporation. 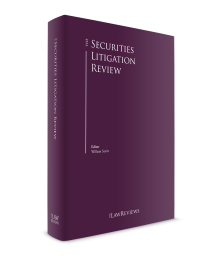 Over the next few years, class actions can be expected to constitute a significant part of securities litigation and their level of sophistication can be expected to increase as case law develops. This has been a continuous trend in recent years, and one can expect this trend to continue in the foreseeable future. There is also likely to be a noticeable increase in the use of administrative procedures in the next few years, and the sums of administrative fines may increase. Caution on the part of publicly traded companies is thus advisable. 1 Yechiel Kasher, Ittai Paldor and Amir Scharf are partners at Tadmor & Co Yuval Levy & Co.
2 See also Civil Appeal 699/99 Bachar Nissim v. TMM, Supreme Court Cases 50(1). 3 Article 52-11 of the Securities Act. 4 Article 1 of the Securities Act. 5 Article 31(a)(1) of the Securities Act. 6 Writ for certiorari 8268/96 Reichart v. Shemesh, 55(5) Supreme Court Cases Report 276 ; and Class action (District Court of Tel Aviv) 2484-09-12 Hatslaha v. Cohen (24 April 2014, available on Nevo). 7 Class action (District Court of Tel Aviv) 1268/07 Kedmy v. Coor Industries 6 June 2013. 8 Class Action Regulations, 2010. 9 Writ for certiorari 5635/13 Coral Tel Ltd v. Aviu Raz et al. (1 April 2015, available on Nevo). 10 Class Action Act, 2006, Article 8. 11 Companies Act, 1999, Article 55C(b). 12 Companies Act, 1999, Articles 1 and 194(a). 13 Companies Act, 1999, Article 198(a). 14 Class Actions (Tel Aviv) 815-09-13 Barry Lenoel v. Galia Maor et al. (11 March 2015, available on Nevo). 16 Class Actions 21785-02-11 Ben Ami v. Menorah Mivtahim Holdings Ltd (7 September 2011, available on Nevo). 17 Writ of certiorari 2903/13 Intercolony investments Ltd v. Shkedy (27 August 2014, available on Nevo). 18 Companies Act, 1999, Article 205A. 19 Companies Act, 1999, Article 198A. 20 Writ of certiorari 4121/14 Tal v. Co-Op Israel (5 February 2015, available on Nevo). 21 Class Action Act, 2006, Article 19. 22 Class Action Act, 2006, Article 19(b)(1) and (b)(4). 23 Class Action Act, 2006, Article 18(b); see also Civil appeal 9585/11 Ya’ari v. Migdal Insurance Company (1 October 2013, available on Nevo). 24 See Class Action Regulations, 2010, Regulation 11. 25 Class Action Act, 2006, Article 16, as amended in 2016. 26 Writ for certiorari 3973/10 David Stern v. Verifone Holdings, Inc. (2 April 2015, available on Nevo). 27 Companies Act, 1999, Article 202(a). 28 Civil appeal 345/03 Reichart v. Shemesh (7 June 2007, available on Nevo). 29 Companies Act, 1999, Articles 336–337. 30 Civil appeal 10406/06 Atzmon v. Bank Hapoalim Ltd (28 December 2009, available on Nevo). 31 Leave to appeal 779/06 Kital Holdings and International Development Ltd v. Maman (28 August 2012, available on Nevo); and Class action (Tel Aviv District Court) 44884-03-13 Malachi v. Elad High Plateau Acquisitions Inc (2 April 2015, available on Nevo).